A mass of proto-matter drops from the sky, climbs inside a decapitated corpse, and walks away; the first person it meets isn’t surprised in the least. 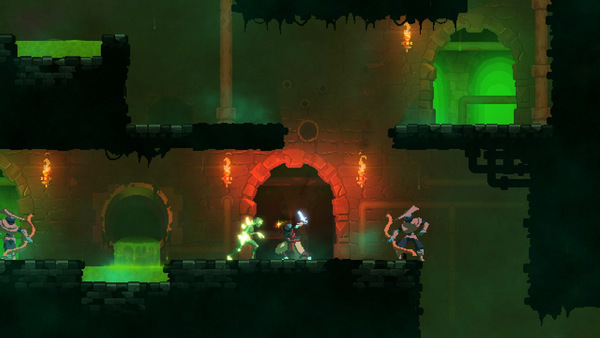 A hands-on session with Dead Cells appears to pose nothing except questions with regard to the story, just as it did for our site editor when he played an earlier version of the game at EGX two years ago, but it appears the gameplay has been tweaked to flow more smoothly and is pretty self-explanatory. A member of the development team mentions Castlevania: Symphony of the Night as a favourite, and you can see some of the inspiration – fairly fast moving platformer, enemies of various kinds attacking when they see you, usable items to collect, cash to spend, upgrades and skills to collect… The only thing that stops it fitting entirely into the Metroidvania bracket is the procedural generation, with segments of levels being hand crafted but the game stitching them together randomly… there is no guarantee that you’ll get a certain skill to access a certain area, but there will always be a way to progress. A lot of the game’s own press releases have recognised these are more Roguelite elements, and coined the game a “Roguevania”. The demo running on the show floor at Rezzed gave the player three chances to press through and defeat the first boss, and it didn’t take long to get into the flow of the action. The platforming is satisfying, following old-school approaches as you jump up and down wooden floors, as well as our protagonist grabbing ledges to pull himself up if you get close enough to a landing before falling short. However, those platforms are rarely uninhabited. There are a wide variety of monsters out to get you, ranging from sword wielding guards and undead archers, through to self-destructing insects and flying critters, and you need to keep varying your attacks accordingly. On starting you get given a vanilla sword, and can roll through enemies to dodge attacks or get around defences. You’ll also get to pick up secondary weapons (at the beginning the choices were a bow – with limited arrows, albeit ones you can recollect from defeated enemies – and a shield, though by the end of my run I had a second type of sword with limited ranged ability instead), and tertiary skills, usually with great destructive power but cooldowns counted in several seconds. Getting the flow of the game – rolling, jumping, attacking, popping a skill when it’s available and will have the most effect… the character feels powerful, albeit only as powerful as long as you’re on top of things, because if you lose that flow your health can get sapped pretty quickly again. And in the demo, as it is implied it’ll be in the final game, there are no checkpoints, meaning if you die, you restart. “2D Souls” it calls this approach in a press-release, where it isn’t the character on screen improving that is meant to take you through the game, it is your ability as a player. Die, learn, retry. Not that the character doesn’t improve, with scrolls of power throughout offering bonuses to stats – a strength/dexterity/vitality choice, which also corresponds to the equipment you collect; a sword might be dex based, and a better choice than a strength one, for example – but offering its best damage immediately after doing a roll-attack. By the time I reached the boss – half an hour of gameplay in the demo – I felt like a beast, tearing my way through all manner of creatures… but despite my best effort, the boss took me down. It was a close run thing though, attack patterns becoming clearer the longer I stood my ground, with a good balance of “not easy” and “not impossible”. 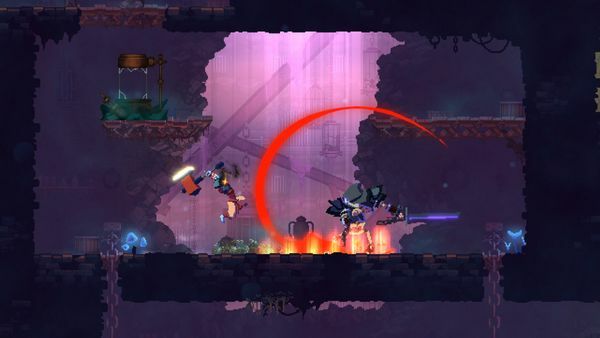 At heart I’m quite an old-school gamer, but realistic enough to appreciate new elements games nowadays have, and that demo of Dead Cells did scratch an itch for me – it follows an old template, but doesn’t feel like it’s trying to be nostalgically “old” with it. Indeed, with the show going on around me it was only the thought of needing to spend another half hour taking my second attempt at the boss that stopped me taking a second run at the guy. Maybe I’d have even discovered why I’m playing as a mass of proto-matter inhabiting a decapitated corpse. 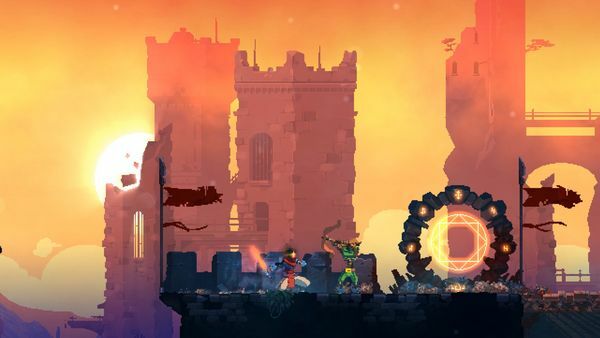 Dead Cells is currently in Early Access on Steam. Full release is planned for this summer on Steam, PlayStation 4, Xbox 1 and Switch.